It is ex English Rhodesia, independent from 1965; with segregationist regime on the South African model from 1969; Republic from 1980. In the first years 2000 there were population fight because of the movement of occupation of the white people's earths, with the later quick economic recession. 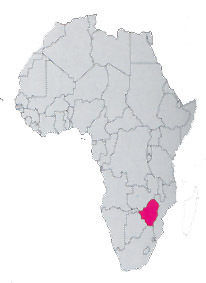 At present the situation is not quiet, to detriment of a very beautiful nation, characterized from a large plateau, that can be divided in High Veld (beyond the 1.400 meters), that occupies all the center of the territory around the big towns of Bulawayo and Harare; in Medium Veld (between 700 and 1.400 meters) and in Low Veld, along the valleys of the Zambezi and of the Limpopo. The territory was lodging a rich fauna before the Europeans' arrival, afterwards it was reduced by the hunt and today it is protected in numerous nature reserves. Among them the most ancient one is the Matobo, instituted in 1926 and the widest one is the immense very beautiful Hwange National Park (14.651 Kmq), elephants' sanctuary (there are about 30.000 of them) but also 17.000 buffalos, 6.000 impala, 5.000 sables, 3.000 zebras and 3.000 giraffes live there. The Victory Waterfalls, to the border with Zambia, are formed from the Zambezi River, whose waters throw in a throat of whinstone of impressive effect, that forms a split of about 2 kilometers for a height of the jump of 107 meters (more of the double of Niagara), with a flow of water that reaches 545 millions of litres to the minute.